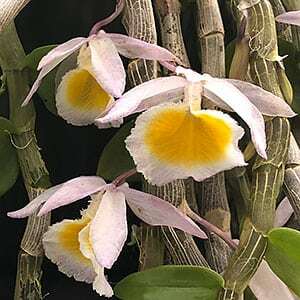 A variable species in terms of flower colour, Dendrobium primulinum is originally from India through to Myanmar. You will find it at many of the orchid society shows, and it is sometimes offered fo sale at these events. It is not often offered for sale in nurseries, however, for collectors it is a magnificent species when mature. This is a species that requires warm conditions year round. Winter temperatures should not drop below around 12 C. Daytime temperatures up to 30 C in summer. Best grown as a mounted specimen, a hanging basket, coir or tree fern mounting block, will all work as long as drainage is good and moisture is maintained. Watering needs to be constant from spring through to autumn, when the plant is in active growth, and then reduced a little and in winter cut back on watering almost completely. Good drainage and air flow in the growing medium is essential for the root systems to grow well. A drop in nighttime temperatures seem to be very important getting this plant to bloom regularly. A little more sun in autumn to winter also seems to help. Origins – Indian to Nepal and Myanmar. Position – Good filtered light with some winter sun. Soil – Free draining and moist, hanging baskets and mounted specimens or slatted orchid baskets. Flower colour – Varies, creamy yellow trumpet with a primrose yellow throat, pale mauve petals.